She is such a tail wagger that she gave herself "Happy Tail"...a common issue among only the sweetest of dogs. It's when they wag their tail so vigorously, banging it on a wall, or their kennel, that they get a boo boo. It heals best when they have plenty of room to wag...like in someone's home. Put your face here! This could be you! What a sweet and gentle girl! We fell in love with this beautiful new girl Monday night. So sweet and gentle, Babel is a wonderful girl. Hi, my name is Tyville Babel and I came from Jefferson County Kennel Club (JCKC) track in Monticello, Florida. I am a beautiful red brindle female Greyhound. 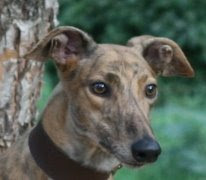 My pedigree can be found at http://www.greyhound-data.com/d?i=1457822&z=9R_BwD and my race record at http://www.greyhound-data.com/d?l=1457822&z=GN2BX. I am cat and small dog tolerant. 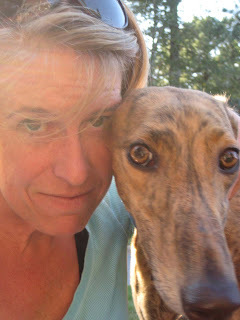 If you'd like to meet me, please contact Suzanne or Patty at adopt@greyhoundadoption.org. Thanks for visiting my blog.